Have you heard Jesus say, “If you do not forgive others of their sins, neither will yours be?” What does Jesus mean? When my natural heart starts to grumble, which is seen as rebellion to God, I start to think of chapters like Philippians 2, and Romans 5:6-10, where the Word puts me in my place and that is on my face, seeking forgiveness for grumbling against things in my life, and by grumbling against things, I am grumbling against God. When the people grumbled yet again, “Moses said, ‘When the Lord gives you in the evening meat to eat and in the morning bread to the full, because the Lord has heard your grumbling that you grumble against him—what are we? Your grumbling is not against us but against the Lord’” (Ex 16:8). When Jude writes about those who are living ungodly lives, he says, “These are grumblers, malcontents, following their own sinful desires; they are loud-mouthed boasters, showing favoritism to gain advantage” (Jude 1:16), so “Do all things without grumbling or disputing, that you may be blameless and innocent, children of God without blemish in the midst of a crooked and twisted generation, among whom you shine as lights in the world” (Phil 2:14-15). When we are tempted to grumble or not forgive others, remember that Jesus died for us while we were ungodly, wicked sinners who were enemies of God (Rom 5:6-10), so even “though he was in the form of God, did not count equality with God a thing to be grasped, but emptied himself, by taking the form of a servant, being born in the likeness of men. And being found in human form, he humbled himself by becoming obedient to the point of death, even death on a cross” (Phil 2:6-8). Doesn’t that take away any excuse to not forgive someone or to grumble? The Bible teaches the forgiveness of sins. The Apostle John said, “If we confess our sins, he is faithful and just to forgive us our sins and to cleanse us from all unrighteousness” (1st John 1:9), and since that is true, how could we not forgive others? Their sins against us are no worse than the sins Jesus paid for in our life, in fact, we owe an infinite debt to God for Jesus’ dying for us. On a human level, two parties can reach an agreement and settle their debts…but for us, without Christ, no amount of money or works could ever pay our sin debt, so how can we not forgive others their debts or sins for a measurable amount of grievances, when we have been forgiven of sins that would have immeasurably doomed us to hell? 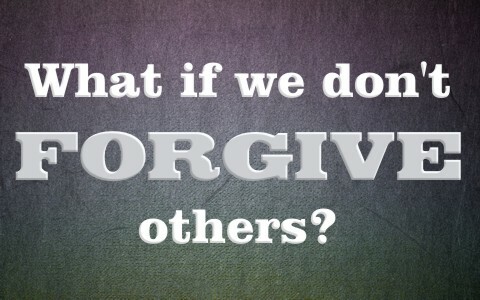 I can go to my brother and that debt can be paid or forgiven, and my brother can forgive me when I have offended him, so after accepting God’s forgiveness for our infinite sins which couldn’t be paid in a million lifetimes, can we not forgive others? The belief that if we don’t forgive others, God will not forgive us, comes from Matthew 6:14-15 where Jesus says, “For if you forgive others their trespasses, your heavenly Father will also forgive you, but if you do not forgive others their trespasses, neither will your Father forgive your trespasses.” This came right after the so-called Lord’s Prayer, which is really a model or template for them so they will know how to pray, and the word “for” in Matthew 6:14 could be considered as “because”, so if we forgive others, God will forgive you. Jesus could have put that there to make sure that they didn’t have any unconfessed sin or refuse to forgive someone, Jesus said, “leave your gift there before the altar and go. First be reconciled to your brother, and then come and offer your gift” (Matt 5:24). That would fit the context of Jesus’ teaching His disciples how to pray, and having a spirit of un-forgiveness can hinder your prayers. I can’t see anything in these two verses that say if we don’t forgive others, it’s the unpardonable sin or they cannot be saved. It does say God will not forgive them, so if we confess our sins, but have not confessed and asked for forgiveness from someone we’ve sinned against, then God may not answer our prayers. Since we’ve not forgiven someone or others, then God is not going to forgive the sins we’ve not confessed. It’s not a matter of losing our relationship, because God is our Father and we remain in His firm grip (John 10:29), but it’s a matter of losing our fellowship with the Father. If my son keeps yelling at his sister and won’t forgive her, even after she’s said she’s sorry, then our relationship is not going to be great, but this will never make me stop being his father. By not forgiving his sister, it will negatively affect what I will do when he asks me for something, but if he reconciles things with his sister, then I’m more likely to bless him with something he wants, because I have now forgiven him for his argument and anger at his sister. Someone can die in the faith in a state of un-forgiveness for someone, and yet be saved. For sure, God will not be pleased and may chasten them for their un-forgiveness, but that doesn’t mean if we don’t forgive someone and then die in the faith, that we’ll have to pay for our sins in hell. I believe that does an injustice to the Scriptures. Think of it this way; a person who has been forgiven should naturally forgive others, because they’ve received so much more forgiveness than they extended or received. Since our salvation doesn’t depend on works, we can easily slip into the error that if we don’t forgive others, we won’t be forgiven and enter the kingdom. A person who doesn’t forgive others might be demonstrating that they are not really saved at all, especially if the person persists in their unforgiving state, however, the Apostle John doesn’t add any conditional statement on 1st John 1:9 where he wrote, “If we confess our sins, he is faithful and just to forgive us our sins and to cleanse us from all unrighteousness,” and there is no, “but if” or “unless this happens,” and neither did Jesus add any clause to His statement: “For God so loved the world, that he gave his only Son, that whoever believes in him should not perish but have eternal life.” John 3:16 Not forgiving others is a very serious sin in God’s eyes. Jesus died for that person! God is not pleased at all when we don’t forgive others, because we’ve been forgiven more than we can even know. Previous post: Who Was Jezebel? Next post: Is Footwashing Commanded?